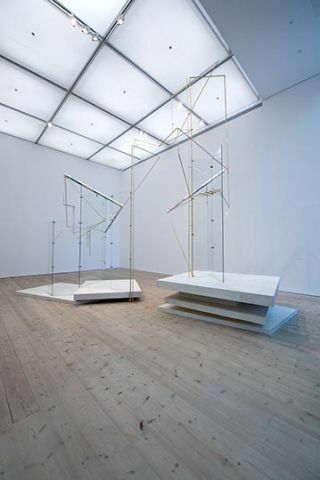 Nancy Holt is a pioneering US artist, but this is her first solo UK show - a belatedness that might have less to do with the vagaries of the art establishment than with Holt’s investment in site-specific environmental and land art. As with many artists who assimilated the conceptual shift away from specific objects to an emphasis on process during the 60s and 70s, and who mined this shift to address experiences of space and duration, Holt has used photographs throughout her career. Haunch of Venison’s focus on Holt’s photography provides both a way into her wider oeuvre, and a meditation on its integral role in her practice - as an ostensible means of documenting and recording, and a medium intrinsically bound up with questions of chronology, witness, and manipulation. Photography’s slippery, complicit status is emphasised here by the fact that many of the images on show are recent prints, using negatives from the 60s and 70s, onto archival rag paper (a ‘permanent’, high-quality paper). Holt second-guesses, even as she invokes, the attempt to treat these photographs as ‘records’ of past work: they extend, rather than re-present, the issues of temporality and experience at stake. Take Wistman’s Wood (1969), subtitled ‘Site of Buried Poem No. 1 (for Robert Smithson)’, composed of eight square prints arranged in pairs, showing sections of a Dartmoor forest, ferny and dank, dappled with amber evening-light. Each image homes in on darkened interstices and holes in tree-boles that tempt and frustrate the eye. The landscape both occludes the poem, and comes to stand as the poem, substituting vision for language, even while the composite work (un)archives an irretrievable moment, buried in place and time. That Smithson, Holt’s collaborator and husband, would die prematurely in a plane crash in 1973, endows this moment with retrospective melancholy. Elsewhere, Trail Markers (1969) sees twenty images track a series of orange markers, blossoming like lichen on rocks and gateposts, across a moorland landscape. Despite the occasional glimpse of a lightly worn footpath, it’s difficult to tell if the camera is tracing the marks, or if the marks have been made for the camera - whether they offer a way into the landscape, or testify to its essential inaccessibility. Like Wistman’s Wood, the piece is elusive, tricksy, acknowledging the desire to keep and preserve while quietly frustrating it. Down Hill (1968), taken in New Jersey, consists of four black and white prints arranged vertically which follow, top to bottom, Holt’s fellow-artist Joan Jonas walking down a hill, as if she has just emerged from a fissure between two rocks at the top. This fissure is too small to admit human passage however, and the traces of footsteps up the hill are visible, undercutting the apparent narrative. 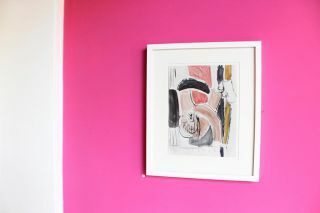 A companion piece Over the Hill (1968), this time in colour, monitors Jonas in a pink top over sixteen frames moving across a white sandy hill, until she disappears. 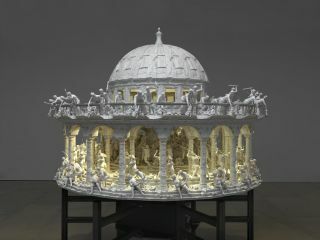 Jonas holds a camera in one hand, emphasising the constructed nature of the series: in both pieces, she avoids looking at the camera taking her picture, establishing a sense of voyeurism while indicating that these journeys are as imagined and metaphorical as they are literal. This is not to suggest that the physical landscapes aren’t significant: geographically speaking, these works demonstrate the correspondences between US artists such as Holt, Jonas and Smithson and UK artists Richard Long, Hamish Fulton and Bruce McLean. The Haunch of Venison photographs, however, reveal a distinctly formalist element in Holt’s work that endures alongside its conceptual and land-art affiliations, particularly evidenced in Concrete Visions (1967), Views Through a Sand Dune (1972) and Sunlight in Sun Tunnels (1976). Each of these demonstrates an interest in light and shape that is connected to the land, but also enjoyed for its own sake. 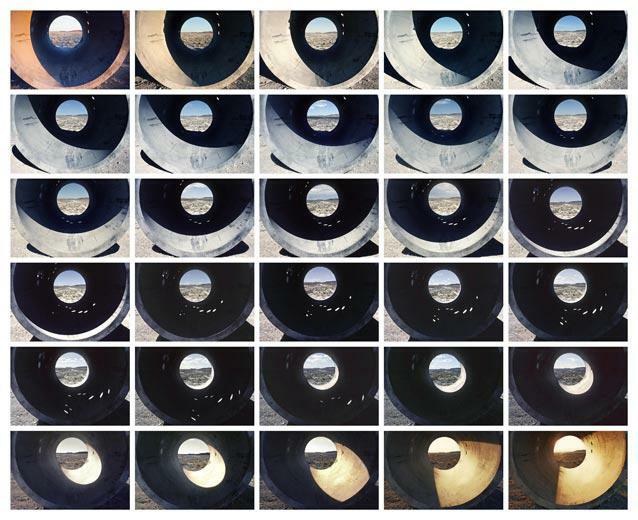 Sunlight in Sun Tunnels is a series of images from a key site-specific earthwork of the same name, consisting of concrete tubes installed in the Utah desert, showing ‘one tunnel photographed every half hour from 6.30am to 9.00pm on 14th July 1976’. The light arcs through the tunnel like a knife, cutting circular formulations that mirror the movement of iris and camera aperture as they adjust to greater or less visibility, resulting in a piece that presents viewing as transient and mutable rather than constant. These concerns are extended in the Light and Shadow Photo-Drawings from 1978, where the architecture of light is explored in a series of rhythmical studies. Perhaps the most affective works on display are the Western Graveyards of 1968 and Pine Barrens (1975), paired together in their own mournfully elegiac room on the second floor. Pine Barrens consists of three subsets, Trees, Hoofs and Footprints, which employ a sense of documentary tracking that is gradually eroded by the camera’s dizzying shifts in focus, and by the disorienting loneliness and desolation that permeates the landscape. 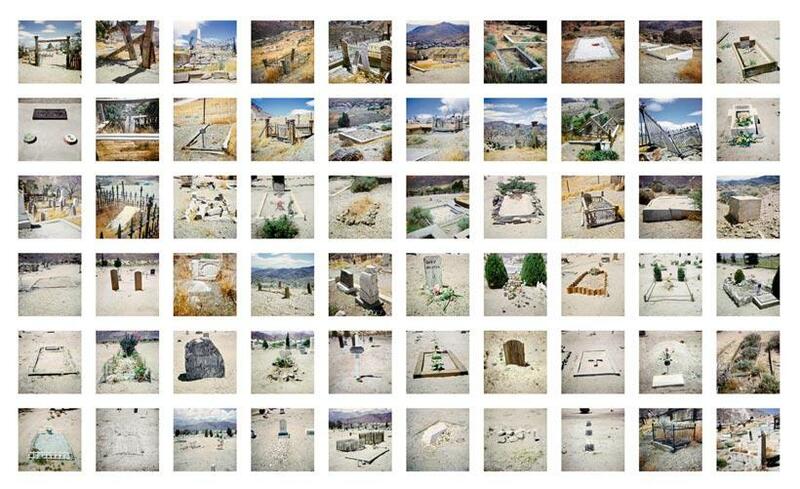 Western Graveyards, the largest work on display, unites 60 photographs of what were once ‘frontier’ graveyards, many of whose signs lie abandoned, eroded by time and weather. The cumulative effect of these graves, some of which are just rectangles of anonymous railings or stones, or a marker bearing the sole word ‘father’, makes for a plangent reflection on the vicissitudes of human attempts to mark and record - a self-depreciating, apt coda.